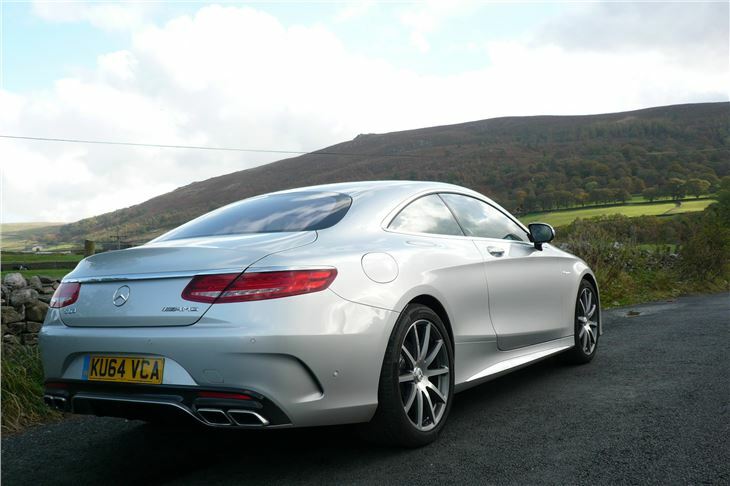 Our first experience of the Mercedes-Benz S-Class Coupe was of a 585PS S63 AMG Coupe on winding, narrow and some sometimes even single track roads around Bolton Abbey in North Yorksire rather than the open road that the car is obviously designed for. 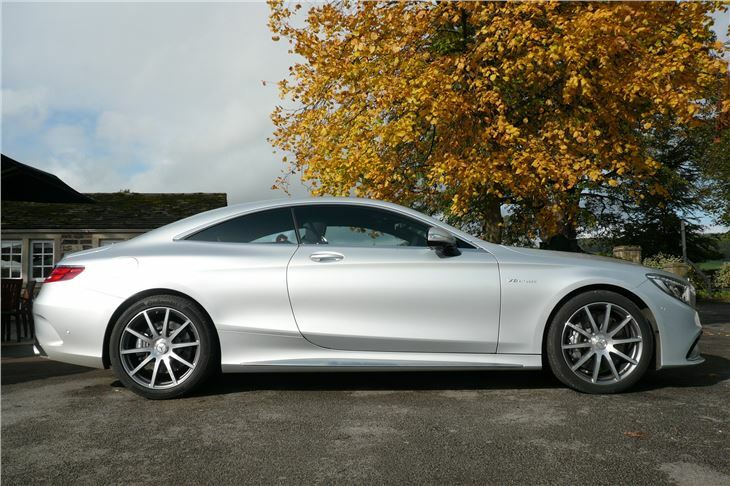 Though the car is as complete as most people could possibly want (see the lengthy specification in the next section), options on our car came to £29,520, bringing the list price up to £155,115. 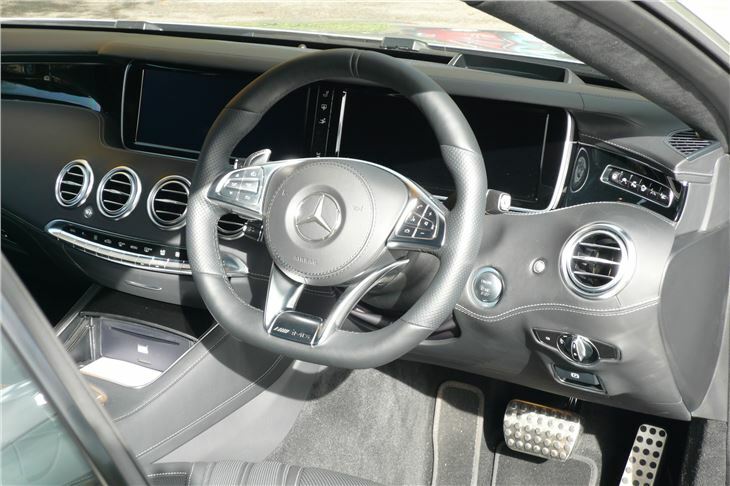 Mercedes Benz stresses that this is a car for rich 'owner drivers' (preferably teetotal) rather than those who prefer to be chauffeured. 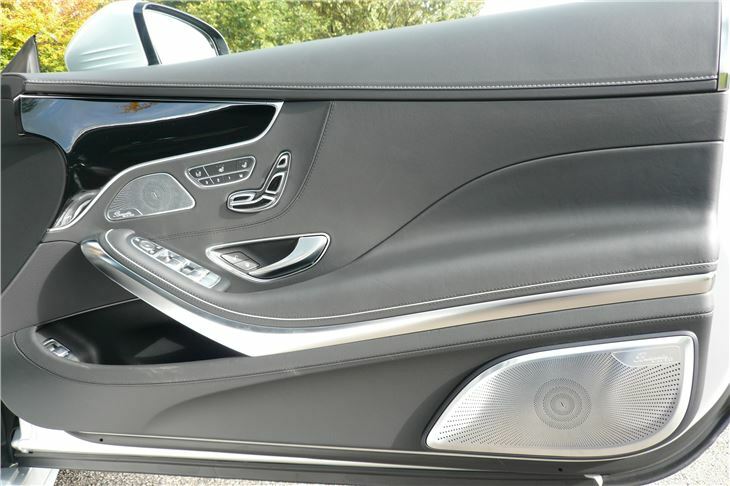 It's an opulent four seater with just enough legroom in the back for those sitting behind average height drivers. The spectacular dash display featres TFT dials, head-up speed display projected onto the windscreen with a bar type rev counter, huge, panoramic satnav and vehicle functions screen, and our car had the optional 'Air-Balance Package' (£380) that infuses the cabin with the perfume of your choice from a refillable container in the glove compartment. You can select three different levels of suspension control and three different sharpnesses of response. Ride in comfort mode is soft and plush, but, of course, those 35 section rear tyres cannot completely cushion sharp ridges and potholes despite Magic Body Control. The "curve tilting function" is the interesting bit, which is only available in 'Sport' mode. The idea is that the car undergoes similar weight transfer to a motorcycle leaning into bends, yet at the same time experiences no body roll. A bit like the 1990s Citroen Xantia Activa, which had a cruder system that nevertheless worked extremely effectively. 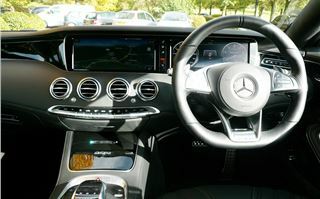 In the Mercedes, it takes a lof of getting used to because it robs the steering of any 'feel'. So it takes a bit of practice to feed the car through a series of bends, but once you get the hang of it, your progress is extremely fluid. On a fast road it can have the effect of making the car feel so smooth through the curves that passengers are unaware of its speed. Performance, of course, is exceptional. 585 'horsepower' and 900Nm torque pull the 0-60 of this massive car down to a mere four seconds, which is Ferrari fast. 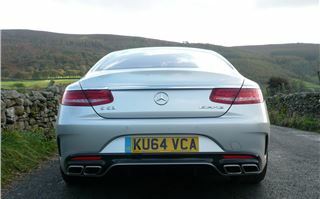 Top speed with the £2,760 AMG Driver's Package is 186mph. Though you pay, of course, with CO2 of 237g/km lifting it into the £485 'K' band. This is a four seater coupe and I did manage to access the rear seats. There is enough sace for a pssenger of average size to sit very comfortably behind an average sized driver, and even see forward. It would not be the same behind a driver 6' or more tall. 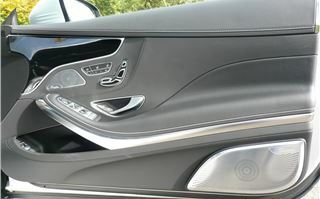 An option in the S63 AMG Coupe is a Bermester high-end 3D surround sound system with 24 speakers and 24-channel amplifier with a total output of 1,520 watts. The example I drove was silver. 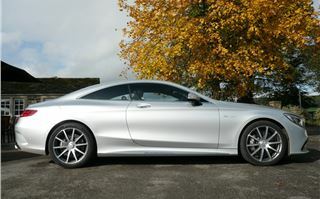 But the S63 AMG coupe looks a lot meaner in black, and has stunning presence. Expect to see a few in Knightsbridge during the June/July supercar season. They could become fashionable among Premier Division footballers. German Forbes listers will pound the autobahns in them. The Chinese will snap them up. And I guess that Russian oligarch wives will go for Swarovski crystal headlights. 23-7-2015: Happily we were able to revisit the S63 AMG Coupe in the more suitable surroundings of Goodwood circuit where the "curve tilting function" could be properly exploited. 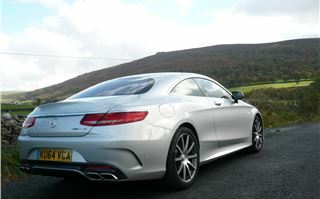 The S63 Coupe is a much bigger car than the others we drove, but strangely I managed to drive one of my more satisfactory laps in it. 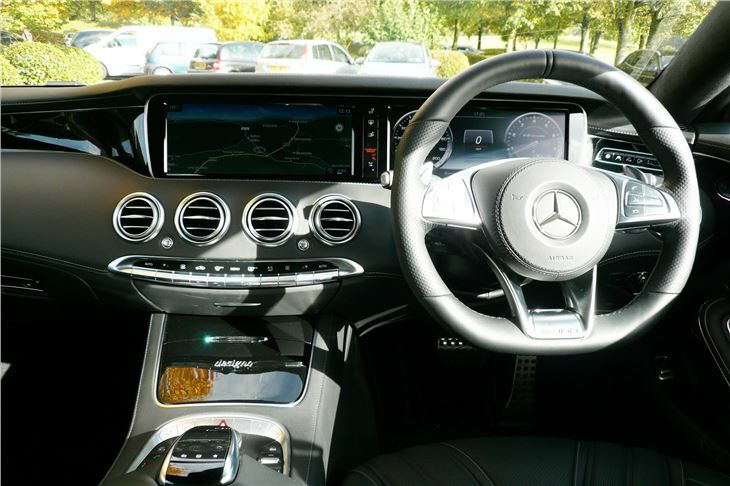 It's softer without being floaty and, while not a sports car, it's certainly very quick indeed and because it doesn't twitch or move around it can be hustled at tremendous speeds without upsetting the occupants of the back seat. It does the job serenely, and you can't say that about many other big luxurious coupes except, perhaps, a Bentley.